Six bedrooms in total sleeps 12, plus 2 pull-out beds & 2 baby cots available. 3 double beds. 6 single beds that can be combined into double beds. 5.5 bathrooms – ground floor sink and wc, Bathroom 1 with w.c., bathtub and two sinks. Bathrooms 2, 3, 4, 5 and in the apartment have w.c., sinks and glass showers. Bedrooms 1, 2, 3 and the apartment have own bathrooms. Bedrooms 4 and 5 share a common bathroom. Large open concept ground floor with kitchen, dining and lounge area with satellite TV, DVDs & games. Second living room on the first floor. Massive kitchen with modern amenities. Catering options available. Self-catering cottage for two. Double bed. Satellite TV & Wifi-Internet. Air-conditioning & heating. Full bathroom. Kitchen. Terrace. Great for grandparents, babysitters, visiting friends. Ground floor terrace for dining, gas and coal-fired BBQs, spaces for sun and shade. First floor back terrace for play, Mediterranean garden and foot path. Private pool with amazing views, enclosed terrace secured with fence, child safe, outdoor shower, sun umbrellas, lounge chairs, tables, toys etc. 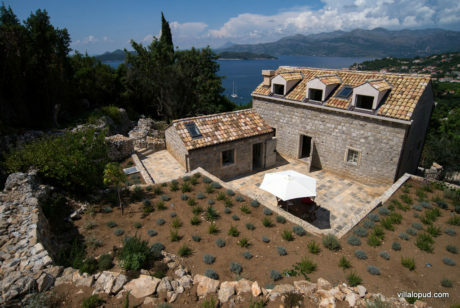 You will love this beautifully restored 17th century villa, which combines old world Dalmatian style with modern comfort and amenities, and offers guests quality and privacy on one of the most gorgeous islands on Croatia’s Adriatic coast. There is no other vacation rental property villa like it on Lopud! Copyright 2019 - Villa Lopud - All Rights Reserved.